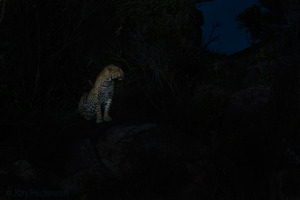 From my last photo-tour for nature photographers to Tanzania. We had the great luck to follow this young male leopard in the Lobo area, and since there are hardly any tourists up here, we had time and I could teach my group to photograph him in many various light conditions - and in my own favourite light; just before darknes in the blue hour. Join our photo-tours and you will be many experiences and techniques richer.